In Sri Caitanya-caritamrta, Srila Prabhupada explains the reasons for Sri Krishna Caitanya’s appearance. Lord Krishna, in His pastimes, was unable to experience the glory of Srimati Radharani’s love for Him, the wonderful qualities in Krishna that She relishes through Her love, and the indescribable happiness She feels when She realizes the sweetness of His love. Thus, Lord Krishna, assuming the guise of a devotee, adopted the mood and complexion of Srimati Radharani and descended in Navadvipa-dhama to fulfill His innermost desire: to experience Srimati Radharani’s ecstatic love for Him. So, Navadvipa-dhama is a manifestation of Srimati Radharani’s love for Krishna. The Puranas also describe that when, in the state of mahabhava, Srimati Radharani reached the extreme in ecstatic feelings of separation from Lord Krishna, He entered into Her heart and “stole” Her feeling of mahabhava. That mahabhava became manifest as Navadvipa-dhama. 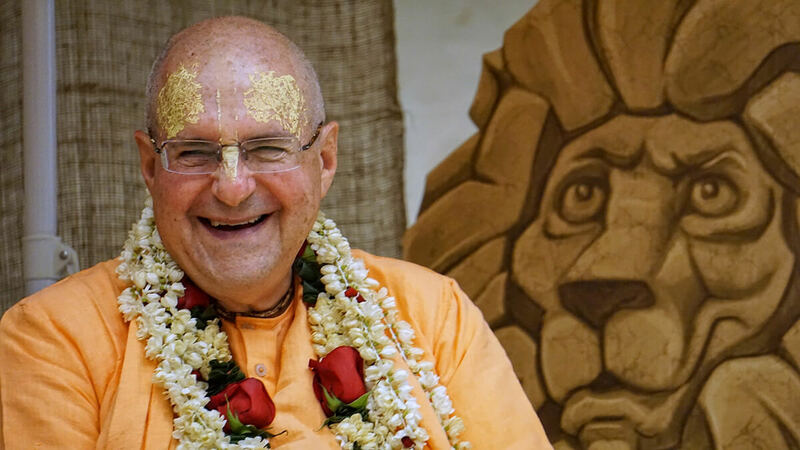 Thus, to better understand Sri Mayapur-dhama and the mood of Caitanya Mahaprabhu, as well as Srila Prabhupada and our own devotional service, we should understand Radharani’s mood of separation. Once, when Krishna left the company of the gopis, Radharani began to search for Him in one forest after another, crying in intense separation. She approached a kadamba tree, “Where is Krishna?” She approached Govardhana Hill, “Where is Krishna?” She wandered everywhere throughout Vrindavan, crying, “Where is Krishna? He is more dear to Me than My own life. How can I live without His service?” Then, in divine madness, She fainted. We see that even though Srimati Radharani had been experiencing extreme separation from Krishna, when Krishna asked Her what She wanted, She did not think of Herself; She thought of the suffering of others. This is the mood of separation. Srimati Radharani’s desire to please Krishna is so pure and so intense that She wants to engage every living entity for Krishna’s pleasure, to give them Krishna’s service and association. Krishna has an unlimited desire to enjoy. Radha has the unlimited desire to fulfill Krishna’s desires. And Lord Caitanya and Srila Prabhupada have the same desire to engage unlimited numbers of living entities in Krishna’s service. Like Srimati Radharani, the preacher wants to arrange for others to get Krishna’s association, to serve Him. Srila Prabhupada especially wanted unlimited numbers of books to be distributed so that unlimited numbers of persons would be engaged in devotional service. Every book distributed means another brick for the Mayapur City temple, and as the city manifests, more and more devotees will be attracted to the dhama, to develop the same mood of sankirtana. And as they become inspired to distribute more and more books, more and more people will become devotees. And thus the Vaishnava’s desire will be fulfilled.